For other uses, see Maxim Gorky (disambiguation). Alexei Maximovich Peshkov (Russian: Алексе́й Макси́мович Пешко́в or Пе́шков; 28 March [O.S. 16 March] 1868 – 18 June 1936), primarily known as Maxim Gorky (Russian: Макси́м Го́рький), was a Russian and Soviet writer, a founder of the socialist realism literary method, and a political activist. He was also a five-time nominee for the Nobel Prize in Literature. Around fifteen years before success as a writer, he frequently changed jobs and roamed across the Russian Empire; these experiences would later influence his writing. Gorky's most famous works were The Lower Depths (1902), Twenty-six Men and a Girl (1899), The Song of the Stormy Petrel (1901), My Childhood (1913–1914), Mother (1906), Summerfolk (1904) and Children of the Sun (1905). He had an association with fellow Russian writers Leo Tolstoy and Anton Chekhov; Gorky would later mention them in his memoirs. Gorky was active with the emerging Marxist social-democratic movement. He publicly opposed the Tsarist regime, and for a time closely associated himself with Vladimir Lenin and Alexander Bogdanov's Bolshevik wing of the party, but later became a bitter critic of Lenin as an overly ambitious, cruel and power-hungry potentate who tolerated no challenge to his authority. For a significant part of his life, he was exiled from Russia and later the Soviet Union. In 1932, he returned to the USSR on Joseph Stalin's personal invitation and lived there until his death in June 1936. Born as Alexei Maximovich Peshkov on 28 March [O.S. 16 March] 1868, in Nizhny Novgorod, Gorky became an orphan at the age of eleven. He was brought up by his grandmother and ran away from home at the age of twelve in 1880. After an attempt at suicide in December 1887, he travelled on foot across the Russian Empire for five years, changing jobs and accumulating impressions used later in his writing. As a journalist working for provincial newspapers, he wrote under the pseudonym Иегудиил Хламида (Jehudiel Khlamida). He started using the pseudonym "Gorky" (from горький; literally "bitter") in 1892, when his first short story, "Makar Chudra", was published by the newspaper Kavkaz (The Caucasus) in Tiflis, where he spent several weeks doing menial jobs, mostly for the Caucasian Railway workshops. The name reflected his simmering anger about life in Russia and a determination to speak the bitter truth. Gorky's first book Очерки и рассказы (Essays and Stories) in 1898 enjoyed a sensational success, and his career as a writer began. Gorky wrote incessantly, viewing literature less as an aesthetic practice (though he worked hard on style and form) than as a moral and political act that could change the world. He described the lives of people in the lowest strata and on the margins of society, revealing their hardships, humiliations, and brutalisation, but also their inward spark of humanity. Gorky's reputation grew as a unique literary voice from the bottom strata of society and as a fervent advocate of Russia's social, political, and cultural transformation. By 1899, he was openly associating with the emerging Marxist social-democratic movement, which helped make him a celebrity among both the intelligentsia and the growing numbers of "conscious" workers. At the heart of all his work was a belief in the inherent worth and potential of the human person. In his writing, he counterposed individuals, aware of their natural dignity, and inspired by energy and will, with people who succumb to the degrading conditions of life around them. Both his writings and his letters reveal a "restless man" (a frequent self-description) struggling to resolve contradictory feelings of faith and scepticism, love of life and disgust at the vulgarity and pettiness of the human world. In 1916, Gorky said that the teachings of the ancient Jewish sage Hillel the Elder deeply influenced his life: "In my early youth I read...the words of...Hillel, if I remember rightly: 'If thou art not for thyself, who will be for thee? But if thou art for thyself alone, wherefore art thou'? The inner meaning of these words impressed me with its profound wisdom...The thought ate its way deep into my soul, and I say now with conviction: Hillel's wisdom served as a strong staff on my road, which was neither even nor easy. I believe that Jewish wisdom is more all-human and universal than any other; and this not only because of its immemorial age...but because of the powerful humaneness that saturates it, because of its high estimate of man." He publicly opposed the Tsarist regime and was arrested many times. Gorky befriended many revolutionaries and became a personal friend of Vladimir Lenin after they met in 1902. He exposed governmental control of the press (see Matvei Golovinski affair). In 1902, Gorky was elected an honorary Academician of Literature, but Tsar Nicholas II ordered this annulled. In protest, Anton Chekhov and Vladimir Korolenko left the Academy. From 1900 to 1905, Gorky's writings became more optimistic. He became more involved in the opposition movement, for which he was again briefly imprisoned in 1901. In 1904, having severed his relationship with the Moscow Art Theatre in the wake of conflict with Vladimir Nemirovich-Danchenko, Gorky returned to Nizhny Novgorod to establish a theatre of his own. Both Konstantin Stanislavski and Savva Morozov provided financial support for the venture. Stanislavski believed that Gorky's theatre was an opportunity to develop the network of provincial theatres which he hoped would reform the art of the stage in Russia, a dream of his since the 1890s. He sent some pupils from the Art Theatre School—as well as Ioasaf Tikhomirov, who ran the school—to work there. By the autumn, however, after the censor had banned every play that the theatre proposed to stage, Gorky abandoned the project. As a financially successful author, editor, and playwright, Gorky gave financial support to the Russian Social Democratic Labour Party (RSDLP), as well as supporting liberal appeals to the government for civil rights and social reform. The brutal shooting of workers marching to the Tsar with a petition for reform on 9 January 1905 (known as the "Bloody Sunday"), which set in motion the Revolution of 1905, seems to have pushed Gorky more decisively toward radical solutions. He became closely associated with Vladimir Lenin and Alexander Bogdanov's Bolshevik wing of the party, with Bogdanov taking responsibility for the transfer of funds from Gorky to Vpered. It is not clear whether he ever formally joined, and his relations with Lenin and the Bolsheviks would always be rocky. His most influential writings in these years were a series of political plays, most famously The Lower Depths (1902). While briefly imprisoned in Peter and Paul Fortress during the abortive 1905 Russian Revolution, Gorky wrote the play Children of the Sun, nominally set during an 1862 cholera epidemic, but universally understood to relate to present-day events. He was released from the prison after a European-wide campaign, which was supported by Marie Curie, Auguste Rodin and Anatole France, amongst others. In 1906, the Bolsheviks sent him on a fund-raising trip to the United States with Ivan Narodny. When visiting the Adirondack Mountains, Gorky wrote Мать (Mat', Mother), his notable novel of revolutionary conversion and struggle. His experiences in the United States—which included a scandal over his travelling with his lover (the actress Maria Andreyeva) rather than his wife—deepened his contempt for the "bourgeois soul" but also his admiration for the boldness of the American spirit. In 1909–1911 Gorky lived on the island of Capri in the burgundy-coloured "Villa Behring". 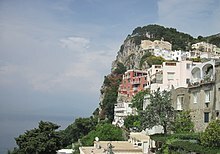 From 1906 to 1913, Gorky lived on the island of Capri in southern Italy, partly for health reasons and partly to escape the increasingly repressive atmosphere in Russia. He continued to support the work of Russian social-democracy, especially the Bolsheviks and invited Anatoly Lunacharsky to stay with him on Capri. The two men had worked together on Literaturny Raspad which appeared in 1908. It was during this period that Gorky, along with Lunacharsky, Bogdanov and Vladimir Bazarov developed the idea of an Encyclopedia of Russian History as a socialist version of Diderot's Encyclopedia. During a visit to Switzerland, Gorky met Lenin, who he charged spent an inordinate amount of his time feuding with other revolutionaries, writing: "He looked awful. Even his tongue seemed to have turned grey". Despite his atheism, Gorky was not a materialist. Most controversially, he articulated, along with a few other maverick Bolsheviks, a philosophy he called "God-Building" (богостроительство, bogostroitel'stvo), which sought to recapture the power of myth for the revolution and to create a religious atheism that placed collective humanity where God had been and was imbued with passion, wonderment, moral certainty, and the promise of deliverance from evil, suffering, and even death. Though 'God-Building' was ridiculed by Lenin, Gorky retained his belief that "culture"—the moral and spiritual awareness of the value and potential of the human self—would be more critical to the revolution's success than political or economic arrangements. An amnesty granted for the 300th anniversary of the Romanov dynasty allowed Gorky to return to Russia in 1913, where he continued his social criticism, mentored other writers from the common people, and wrote a series of important cultural memoirs, including the first part of his autobiography. On returning to Russia, he wrote that his main impression was that "everyone is so crushed and devoid of God's image." The only solution, he repeatedly declared, was "culture". 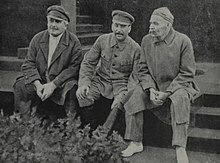 After the February Revolution, Gorky visited the headquarters of the Okhrana (secret police) on Kronversky Prospekt together with Nikolai Sukhanov and Vladimir Zenisinov. Gorky described the former Okhrana headquarters, where he sought literary inspiration, as derelict, with windows broken, and papers lying all over the floor. 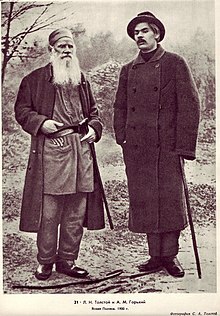 Having dinner with Sukhanov later the same day, Gorky grimly predicated that revolution would end in "Asiatic savagery". Initially a supporter of the Socialist-Revolutionary Alexander Kerensky, Gorky switched over to the Bolsheviks after the Kornilov affair. In July 1917, Gorky wrote his own experiences of the Russian working class had been sufficient to dispel any "notions that Russian workers are the incarnation of spiritual beauty and kindness". Gorky admitted to feeling attracted to Bolshevism, but admitted to concerns about a creed that made the entire working class "sweet and reasonable-I had never known people who were really like this". Gorky wrote that he knew the poor, the "carpenters, stevedores, bricklayers", in a way that the intellectual Lenin never did, and he frankly distrusted them. During World War I, his apartment in Petrograd was turned into a Bolshevik staff room, and his politics remained close to the Bolsheviks throughout the revolutionary period of 1917. On the day after the Bolshevik coup of 7 November 1917, Gorky observed a gardener working the Alexander Park who had cleared snow during the February Revolution while ignoring the shots in the background, asked people during the July Days not to trample the grass and was now chopping off branches, leading Gorky to write that he was "stubborn as a mole, and apparently as blind as one too". Gorky's relations with the Bolsheviks became strained, however, after the October Revolution. One contemporary remembered at how Gorky would turn "dark and black and grim" at the mere mention of Lenin. Gorky wrote that Lenin together with Trotsky "have become poisoned with the filthy venom of power", crushing the rights of the individual to achieve their revolutionary dreams. Gorky wrote that Lenin was a "cold-blooded trickster who spares neither the honor nor the life of the proletariat. ... He does not know the popular masses, he has not lived with them". Gorky went on to compare Lenin to a chemist experimenting in a laboratory with the only difference being the chemist experimented with inanimate matter to improve life while Lenin was experimenting on the "living flesh of Russia". A further strain on Gorky's relations with the Bolsheviks occurred when his newspaper Novaya Zhizn (Новая Жизнь, "New Life") fell prey to Bolshevik censorship during the ensuing civil war, around which time Gorky published a collection of essays critical of the Bolsheviks called Untimely Thoughts in 1918. (It would not be re-published in Russia until after the collapse of the Soviet Union.) The essays call Lenin a tyrant for his senseless arrests and repression of free discourse, and an anarchist for his conspiratorial tactics; Gorky compares Lenin to both the Tsar and Nechayev. "Lenin and his associates," Gorky wrote, "consider it possible to commit all kinds of crimes ... the abolition of free speech and senseless arrests." In 1921, he hired a secretary, Moura Budberg, who later became his unofficial wife. In August 1921, the poet Nikolay Gumilev was arrested by the Petrograd Cheka for his monarchist views. There is a story that Gorky hurried to Moscow, obtained an order to release Gumilev from Lenin personally, but upon his return to Petrograd he found out that Gumilev had already been shot – but Nadezhda Mandelstam, a close friend of Gumilev's widow, Anna Akhmatova wrote that: "It is true that people asked him to intervene. ... Gorky had a strong dislike of Gumilev, but he nevertheless promised to do something. He could not keep his promise because the sentence of death was announced and carried out with unexpected haste, before Gorky had got round to doing anything." In October, Gorky returned to Italy on health grounds: he had tuberculosis. Gorky left Russia in September 1921, for Berlin. There he heard about the impending Moscow Trial of 12 Socialist Revolutionaries, which hardened his opposition to the Bolshevik regime. He wrote to Anatole France denouncing the trial as a "cynical and public preparation for the murder" of people who had fought for the freedom of the Russian people. He also wrote to the Soviet vice-premier, Alexei Rykov asking him to tell Leon Trotsky that any death sentences carried out on the defendants would be "premeditated and foul murder." This provoked a contemptuous reaction from Lenin, who described Gorky as "always supremely spineless in politics", and Trotsky, who dismissed Gorky as an "artist whom no-one takes seriously." He was denied permission by Italy's fascist government to return to Capri, but was permitted to settle in Sorrento, where he lived from 1922 to 1932, with an extended household that included Moura Budberg, his ex-wife Andreyeva, her lover, Pyotr Kryuchkov, who acted as Gorky's secretary for the remainder of his life, Gorky's son Max Peshkov, Max's wife, Timosha, and their two young daughters. He wrote several successful books while there, but by 1928 he was having difficulty earning enough to keep his large household, and began to seek an accommodation with the communist regime. The Soviet dictator. Josif Stalin was equally keen to entice Gorky back to the USSR. He paid his first visit in May 1928 – at the very time when the regime was staging its first show trial since 1922, the so-called Shakhty Trial of 53 engineers employed in the coal industry, one fo whom, Pyotr Osadchy, had visited Gorky in Sorrento. In contrast to his attitude to the trial of the Socialist Revolutionaries, Gorky accepted without question that the engineers were guilty, and expressed regret that in the past he had intervened on behalf of professionals who were being persecuted by the regime. During the visit, he struck up a friendships with Genrikh Yagoda, the corrupt and murderous head of the Ogpu and two other Ogpu officers, Semyon Firin and Matvei Pogrebinsky, who held high office in the Gulag. Pogrebinsky was Gorky's guest in Sorrento for four weeks in 1930. The following year, Yagoda sent his brother-in-law, Leopold Averbakh to Sorrento, with instructions to induce Gorky to return to Russia permanently. Gorky's return from Fascist Italy was a major propaganda victory for the Soviets. He was decorated with the Order of Lenin and given a mansion (formerly belonging to the millionaire Pavel Ryabushinsky, which was for many years the Gorky Museum) in Moscow and a dacha in the suburbs. The city of Nizhni Novgorod, and the surrounding province were renamed Gorky. Moscow's main park, and one of the central Moscow streets, Tverskaya, were renamed in his honour, as was the Moscow Art Theatre. The largest fixed-wing aircraft in the world in the mid-1930s, the Tupolev ANT-20 was named Maxim Gorky in his honour. He was also appointed President of the Union of Soviet Writers, founded in 1932, to coincide with his return to the USSR. On 11 October 1931 Gorky read his fairy tale "A Girl and Death" to his visitors Joseph Stalin, Kliment Voroshilov and Vyacheslav Molotov, an event that was later depicted by Viktor Govorov in his painting. On that same day Stalin left his autograph on the last page of this work by Gorky: "Эта штука сильнее чем "Фауст" Гёте (любовь побеждает смерть)" ["This piece is stronger than Goethe's Faust (love defeats death)]". In 1933, Gorky co-edited, with Averbakh and Firin, an infamous book about the White Sea-Baltic Canal, presented as an example of "successful rehabilitation of the former enemies of proletariat". For other writers, he urged that one obtained realism by extracting the basic idea from reality, but by adding the potential and desirable to it, one added romanticism with deep revolutionary potential. For himself, Gorky avoided realism. His denials that even a single prisoner died during the construction of the aforementioned canal were refuted by multiple accounts of thousands of prisoners who froze to death not only in the evenings from the lack of adequate shelter and food, but even in the middle of the day. 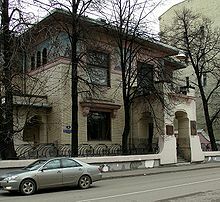 On his definitive return to the Soviet Union in 1932, Maxim Gorky received the Ryabushinsky Mansion, designed in 1900 by Fyodor Schechtel for the Ryabushinsky family. The mansion today houses a museum about Gorky. Gorky strongly supported efforts in getting a law passed in 1934, making homosexuality a criminal offense. His attitude was coloured by the fact that several leading members of the Nazi Sturmabteilung, or Brownshirts, were overtly homosexual. Writing in Pravda on 23 May 1934, Gorky claimed "exterminate all homosexuals and fascism will vanish." By the summer of 1934, Gorky was increasingly in conflict with the Soviet authorities. He was angry that Leopold Averbakh, whom he regarded as a protege, was denied a role in the newly created Writers Union, and objected to interference by the Central Committee staff in the affairs of the union. This conflict, which may have been exacerbated by Gorky's despair over the early death of his son, Max, came to a head just before the first Soviet Writers Congress, in August 1934. On 11 August, he submitted an article for publication in Pravda which attacked the deputy head of the press department, Pavel Yudin with such intemperate language that Stalin's deputy, Lazar Kaganovich ordered its suppression, but was forced to relent after hundreds of copies of the article circulated by hand. Gorky's draft of the keynote speech he was due to give at the congress caused such consternation when he submitted it to the Politburo that four of its leading members – Kaganovich, Vyacheslav Molotov. Kliment Voroshilov, and Andrei Zhdanov – were sent to persuade him to make changes. Even in its toned-down version – very unusually for the Stalin era – he did not praise Stalin, did not mention any of the approved writers turning out 'socialist realist' novels, but singled out Fyodor Dostoevsky for "having painted with the most vivid perfection of word portraiture a type of egocentrist, a type of social degenerate in the person of the hero of his Memoirs from Underground. ... Dostoyevsky in the figure of his hero has shown the depths of whining despair that are reached by the individualist from among the young men of the nineteenth and twentieth centuries who are cut off from real life." With the increase of Stalinist repression and especially after the assassination of Sergei Kirov in December 1934, Gorky was placed under unannounced house arrest in his house near Moscow. His long-serving secretary Pyotr Kryuchkov had been recruited by Yagoda as a paid informer. Before his death from a lingering illness in June 1936, he was visited at home by Stalin, Yagoda, and other leading communists, and by Moura Budberg, who had chosen not to return to the USSR with him but was permitted to stay for his funeral. The sudden death of Gorky's son Maxim Peshkov in May 1934 was followed by the death of Maxim Gorky himself in June 1936 from pneumonia. Speculation has long surrounded the circumstances of his death. Stalin and Molotov were among those who carried Gorky's coffin during the funeral. During the Bukharin trial in 1938 (one of the three Moscow Trials), one of the charges was that Gorky was killed by Yagoda's NKVD agents. In Soviet times, before and after his death, the complexities in Gorky's life and outlook were reduced to an iconic image (echoed in heroic pictures and statues dotting the countryside): Gorky as a great Soviet writer who emerged from the common people, a loyal friend of the Bolsheviks, and the founder of the increasingly canonical "socialist realism". The Gorky Trilogy is a series of three films based on the three autobiographical books: The Childhood of Maxim Gorky, My Apprenticeship, and My Universities, directed by Mark Donskoy, filmed in the Soviet Union, released 1938–1940. The trilogy was adapted from Gorky's autobiography. The German modernist Bertolt Brecht based his epic play The Mother (1932) on Gorky's novel of the same name. Gorky's novel was also adapted for an opera by Valery Zhelobinsky in 1938. In 1912, the Italian composer Giacomo Orefice based his opera Radda on the character of Radda from Makar Chudra. Our Father is the title given to Gorky's The Last Ones in its English translation by William Stancil. The play[clarification needed] made its New York debut in 1975 at the Manhattan Theater Club, directed by Keith Fowler. In 1985 Enemies was performed in London with a multi-national cast directed by Ann Pennington in association with Internationalist Theatre. The cast included South African Greek actress Angelique Rockas and Bulgarian Madlena Nedeva playing the parts of Tatiana, and Kleopatra respectively. Tom Vaughan of The Morning Star affirmed "this is a great revolutionary play, by a great revolutionary writer, performed with elegance and style, great passion and commitment". BBC Russian Service was no less complimentary. Source: Turner, Lily; Strever, Mark (1946). Orphan Paul; A Bibliography and Chronology of Maxim Gorky. New York: Boni and Gaer. pp. 261–270. Sloboda Tuzla football club from Bosnia and Herzegovina, originally called FK Gorki. ^ His own pronunciation, according to his autobiography Detstvo (Childhood), was Пешко́в, but most Russians say Пе́шков, which is therefore found in reference books. ^ a b c d e f g Liukkonen, Petri. "Maxim Gorky". Books and Writers (kirjasto.sci.fi). Finland: Kuusankoski Public Library. Archived from the original on 6 July 2009. ^ "Nomination Archive". NobelPrize.org. Retrieved 10 December 2018. ^ "Maxim Gorky". Library Thing. Retrieved 21 July 2009. ^ Commentaries to Макар Чудра. The Works by M.Gorky in 30 volumes. Vol.1. Khudozhestvennaya Literatura // На базе Собрания сочинений в 30-ти томах. ГИХЛ, 1949–1956. ^ Commentaries to Makar Chudra // Горький М. Макар Чудра и другие рассказы. – М: Детская литература, 1970. – С. 195–196. – 207 с. ^ Isabella M. Nefedova. Maxim Gorky. The Biography // И.М.Нефедова. Максим Горький. Биография писателя Л.: Просвещение, 1971. ^ Handbook of Russian Literature, Victor Terras, Yale University Press, 1990. ^ Vladimir Nemirovich-Danchenko had insulted Gorky with his critical assessment of Gorky's new play Summerfolk, which Nemirovich described as shapeless and formless raw material that lacked a plot. Despite Stanislavski's attempts to persuade him otherwise, in December 1904 Gorky refused permission for the MAT to produce his Enemies and declined "any kind of connection with the Art Theatre." See Benedetti (1999, 149–150). ^ a b c d Benedetti (1999, 150). ^ Moynahan 1992, p. 117. ^ Evgeniĭ Aleksandrovich Dobrenko (2007). Political Economy of Socialist Realism. Yale University Press. p. 76. ISBN 978-0-300-12280-0. Gorky hated religion with all the passion of a former God-builder. Probably no other Russian writer (unless one considers Dem'ian Bednyi a writer) expressed so many angry words about God, religion, and the church. But Gorky's atheism always fed on that same hatred of nature. He wrote about God and about nature in the very same terms. ^ Tova Yedlin (1999). Maxim Gorky: A Political Biography. Greenwood Publishing Group. p. 86. ISBN 978-0-275-96605-8. Gorky had long rejected all organized religions. Yet he was not a materialist, and thus he could not be satisfied with Marx's ideas on religion. When asked to express his views about religion in a questionnaire sent by the French journal Mercure de France on April 15, 1907, Gorky replied that he was opposed to the existing religions of Moses, Christ, and Mohammed. He defined religious feeling as an awareness of a harmonious link that joins man to the universe and as an aspiration for synthesis, inherent in every individual. ^ Moynahan 1992, p. 91 & 95. ^ Moynahan 1992, p. 91. ^ Moynahan 1992, p. 95. ^ Moynahan 1992, p. 246. ^ Moynahan 1992, p. 201. ^ a b Moynahan 1992, p. 202. ^ Moynahan 1992, p. 318. ^ a b c d Moynahan 1992, p. 330. ^ Harrison E. Salisbury, Black Night, White Snow, New York, 1978, p. 540. ^ Mandelstam, Nadezhda (1971). Hope Against Hope, a Memoir. London: Collins & Harvill. p. 110. ISBN 0 00 262501 6. ^ McSmith, Andy (2015). Fear and the Muse Kept Watch, The Russian Masters – from Akhmatova and Pasternak to Shostakovich and Eisenstein – under Stalin. New York: The New Press. p. 86. ISBN 978-1-59558-056-6. ^ McSmith. Fear and the Muse. p. 82. ^ Tova Yedlin (1999). Maxim Gorky: A Political Biography. Praeger. p. 229. ^ McSmith. Fear and the Muse. pp. 84–88. ^ "Scan of the page from "A Girl And Death" with autograph by Stalin". Archived from the original on 7 September 2012. Retrieved 21 July 2009. ^ Solzhenitsyn, Alexander (2007). The Gulag Archepelago. Harper Perennial. pp. 199–205. ^ McSmith. Fear and the Muse. p. 160. ^ Gorky, Maxim. "Soviet Literature". Soviet Writers' Congress 1934. Marxist Internet Archive. Retrieved 4 January 2019. ^ McSmith. Fear and the Muse. p. 91. ^ Internationalist Theatre (December 2015). "Enemies-Production Data". Theatricalia.com – via theatricalia.com. ^ Tom Vaughan (26 March 1985). "Review of Enemies". The Morning Star – via Internet Archive. ^ "BBC broadcast review of Enemies". BBC Russian Service. 30 March 1985 – via Internet Archive. ^ Orphan Paul, Boni and Gaer, NY, 1946. ^ Richard Freeborn (1985). The Russian Revolutionary Novel: Turgenev to Pasternak. Cambridge University Press. pp. 173–174. ISBN 978-0-521-31737-5. ^ William Stancil's English translation, titled Our Father, was premiered by the Virginia Museum Theater in 1975, under the direction of Keith Fowler. Its New York debut was at the Manhattan Theater Club. ^ The manuscript of this work, which Gorky wrote using information supplied by his friend Chaliapin, was translated, together with supplementary correspondence of Gorky with Chaliapin and others, in N. Froud and J. Hanley (Eds and translators), Chaliapin: An Autobiography as told to Maxim Gorky (Stein and Day, New York 1967) Library of Congress card no. 67-25616. ^ Gorky, Maxim (September 2001). Literary Portraits. The Minerva Group, Inc. ISBN 978-0-89875-580-0. "Gorky and Soviet literature". The Slavonic and East European Review. 25 (64). November 1946.